Eugène Boban began life in humble circumstances in Paris, traveled to the California Gold Rush, and later became a recognized authority on pre-Columbian cultures. 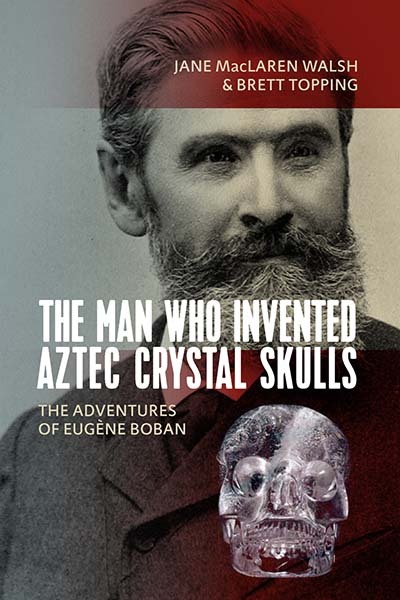 He also invented an entire category of archaeological artifact: the Aztec crystal skull. By his own admission, he successfully “palmed off” a number of these crystal skulls on the curators of Europe’s leading museums. How could that happen, and who was this man? Detailed are the travels, self-education, and archaeological explorations of Eugène Boban; this book also explores the circumstances that allowed him to sell fakes to museums that would remain undetected for over a century. Jane MacLaren Walsh, anthropologist emerita at the Smithsonian Institution’s National Museum of Natural History, is an internationally recognized authority on crystal skulls and other fake pre-Columbian antiquities. Her most recent research combines geology and archaeology in a study of the iconic stone faces of Teotihuacan. Brett Topping has been a professional writer and editor of arts and humanities publications for more than thirty-five years. During her career she was Editor at the American Folklife Center at the Library of Congress, and Director of Publications for the National Museum of Women in the Arts (NMWA).